If cats bathe themselves, then why get them groomed? Cats are prey animals, as well as predators. In order to remain unseen by predators, they attempt to reduce their scent as much as possible. Although your home is safe, cats are hard-wired to be prepared for anything. If you saw the world from the perspective of a cat, you would understand why they bury their waste, pretend to bury food they are not going to eat, keep themselves clean, and climb up high or crawl under objects. These methods help them stay invisible from danger. However, the cat's daily task of bathing may be more difficult due to the processed diets that we feed them. It is our job, as their loving owners and friends, to help our cats feel comfortable and safe at home. Cats are not vain; cats respond to a biological directive to survive. Grooming services, such as haircuts and baths, support this and is a treat for our beloved cat companions. For any grooming services, we would like to ask that you bring your beloved cat-panion in a carrier. This will help reduce their stress and keep them safe as well. Please note that ALL grooming REQUIRES an appointment to be fulfilled. We do not groom any time before 11:30AM or after 5:00PM on weekENDS, and up to 6:00PM on weekDAYS. During your groom, please feel free to ask our opinion on how your kitty is doing. We have an extensive checklist to make sure we can help you be hands on and up to date with your kitty's overall health and well-being. Note: WE DO NOT DO SHOW QUALITY GROOMS. 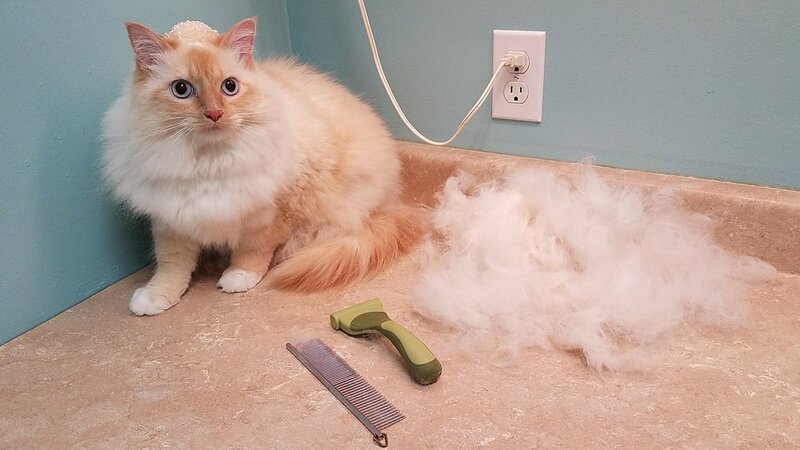 If your kitty is fractious, extremely wiggly, or too scared in the grooming room, we may not be able to fulfill this service as we would like to make sure your kitty (as well as our staff) is comfortable and safe. NOTE: WE ARE NOT VETERINARIANS AND WE MAKE SUGGESTIONS BASED ON OBSERVATIONS WE SEE WITH YOUR KITTIES. This not intended to be a substitute for professional veterinarian advice, diagnosis, or treatment. Always seek the advice of your veterinarian with any questions you may have regarding the medical condition of your pet. Never disregard professional advice or delay in seeking it because of something we say or notice. If you think your pet has a medical emergency, call or visit your veterinarian or your local veterinary emergency hospital immediately. Reliance on any information appearing on this website or from our staff is entirely at your own risk. Walk In Grooms Start At 11:30 am and end at 5:00 pm on weekends, 6:00 pm on weekdays. Clipping of front and back claws. Trims excess hair from paw pads. Cleaning of hairless portion of ears and ear canal with ear cleaner. NOTE: Every groom below requires an appointment to be fulfilled. To schedule an appointment for grooming, call our Kirkland (425)576-5548 location, or our Redmond (425)307-1008 location. All PHONE CALL grooming requests have priority to email grooms due to the high volume of grooming requests we receive. To achieve these haircuts, we use electronic clippers to shave the hair. We do NOT use scissors. Clipper guards are used for longer hair cuts, the longest being 1/4 ~ 1/2 inches. Our signature, short summer cut. Comes with Pom or Full tails. Slightly longer than the Classic. Comes ONLY with Full tail. Using a stainless steel comb from Safari, and a ShedMagic, we brush out the undercoat to reduce shedding. Lower belly and bum shave, helps provide clearance to prevent urine or feces getting stuck in hairs. From mane line to bum shave, helps with matting under armpits and clearance for refuse. Helps keep cool during summer time. Plastic or silicone caps are placed over clipped nails to help prevent clawing of furniture. 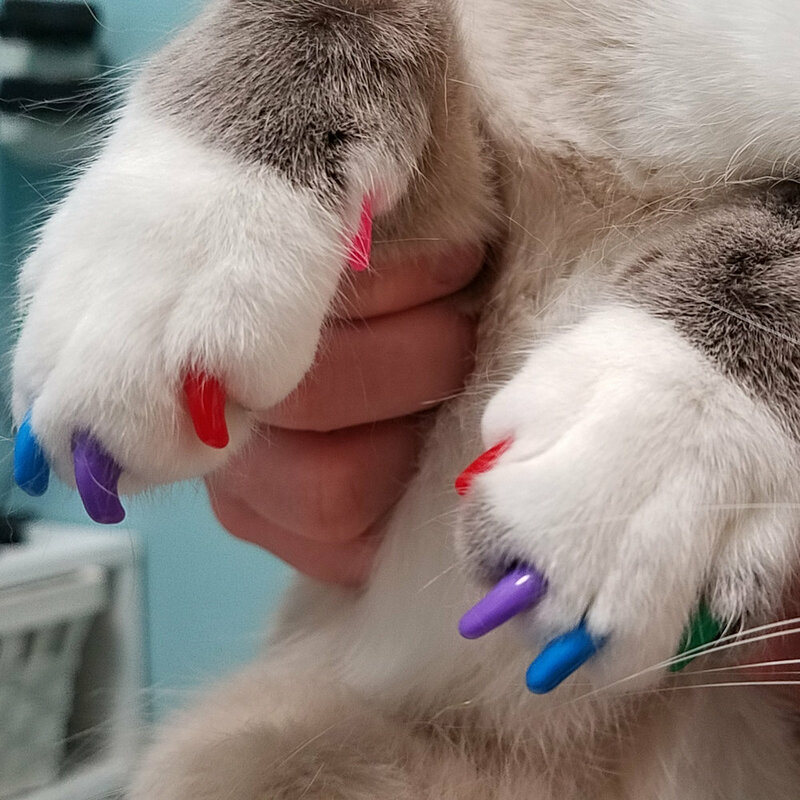 Best alternative to declawing. A warm bubbly bath using locally made natural shampoos. Includes ears, eyes, and face cleaning with breath freshener. Conditioner optional, at no extra cost. Water free bath with aloe based foam massaged into the skin to break up oils. Includes ears, eyes, and face cleaning with breath freshener. Conditioner optional, at no extra cost. A full water bath with flea soap, flea combing to remove any dead fleas, as well as use of an oral flea medication. Note: if you do not treat your home, your kitty will get fleas again from fleas hiding in the house. Oral flea medication administered with a Pill Masker. Kills fleas for up to 24 hours, and is okay for daily use, but is not recommended to use long term. Shaving of just the belly, does not include bum shave or down the back legs. Shave focused on and around the bum. Brushing or shaving out mats or knots focusing on matted areas only. If the demat exceeds 30 minutes due to excessive matting, it will be an additional $15. Add on for fractious cats. Add on for severe matting, due to the extra time and care needed for removal.